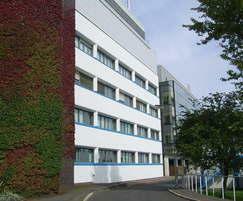 BioPark, the science and technology development in Welwyn Garden City, required a complete facelift to the exterior. The existing mosaic tiles and concrete were discoloured, giving a dull and dirty appearance, and were in need of various repairs. Hydron cleaning solutions were used to powerwash the whole of the exterior of the building, and all defective tiles and cracks were repaired using Nu-Patch epoxy repair mortar. The coating selected was Nu-Guard anti-carbonation coating, formulated using nanotechnology. The three-month contract was undertaken by Armour Contracts, who operate throughout London and the Home Counties.